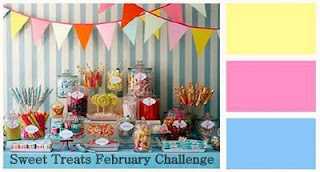 Alphra from Imaginsce got to choose the challenge for the month of February and she decided on a Color Challenge of blue, yellow and pink. All I had to do was create a project of any kind using the above picture as my inspiration. Then link my finished project before Feb 25 on the Imaginisce site to be in the running for a $75 i-top package or Imaginisce collections of the same value. I made this "sweet" mirror for my grand daughter. I thought how "sweet" it would be for her to hang it in her bedroom. The color challenge was just the prefect inspiration to get it done. I chose the Enchanted Fairy Trails paper to use for the mirror frame and used my Holiday Cricut Cartridge to do a fit to page eyelet circle. I also used my Holiday Cake Cartridge and cut a fit to page eyelet scallop circle from a piece of Lucy Bird paper. It measure 5 3/4" in diameter. I cut the circle into small triangles at the scallop edge to make all of my pieces. I just used my flower kit from McGill and rolled my flowers, layered them on a 3/4" circle and made these "sweet" flowers to place on my mirror. I also used some of the Imaginisce Pop Up Poises and some quilled flowers I make from circles (I shared a how to on a previous post). I did some fussy cut flowers, bird and butterfly from my Lucy Bird Paper. I also added some pretty pink tatted ribbon on the inside of the frame, along with some blue gemstones on the center of my blue flowers. This is beyond adorable. Your granddaughter is going to love it!! oh how gorgeous!!! Lots of love in that project. she will love it!!! Very cute! Love the color choices! Beautiful! She will cherish it! Once again I love this!!!! This is awesome!! I picked you as one of my favorites this week over at http://patchesofpink.com.